King Django (a.k.a. Jeff Baker) is a genre-wide well-known producer and singer since the 80s, and has been a long time contributor to the New York City ska/reggae scene, best known (and critically praised) for his unique reggae/dancehall/ska style. On his latest, A Simple Thread King Django gathers all of his best solo songs and collaborations with bands - between Skinnerbox, Stubborn All-stars, Roots and Culture (Yiddish reggae band) - and comprises them into one album. This is King Django at his best -- singing and playing many different instruments. This is truly some exemplary stuff. To be honest, I have never been a big King Django fan, but this album has me doing a double take, and is leading me to re-examine the entire King Django catalog. 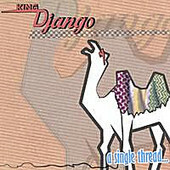 Songs such as "Open Season", "Tired of Struggling", and "LKO" are what King Django does best. If you are more into the reggae-side of ska, King Django is for you.